Looking for bathroom design ideas? 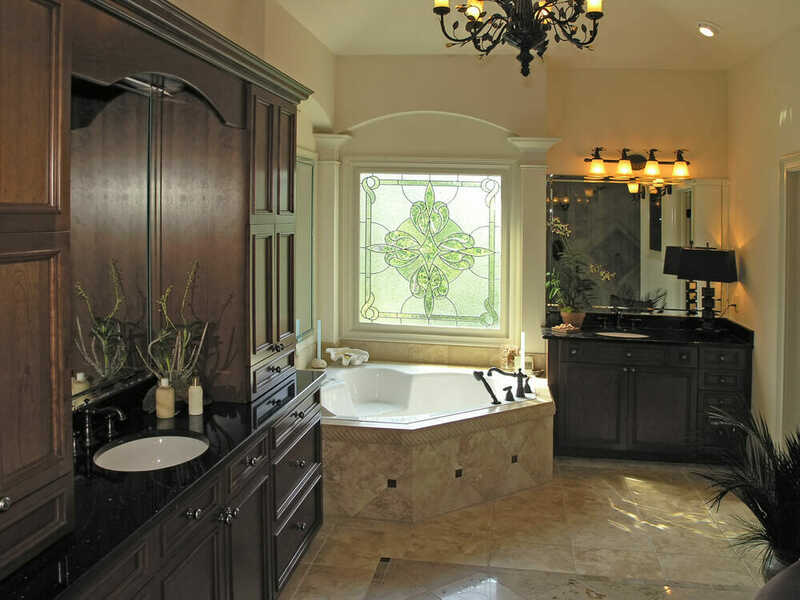 View our pictures of custom bathrooms. 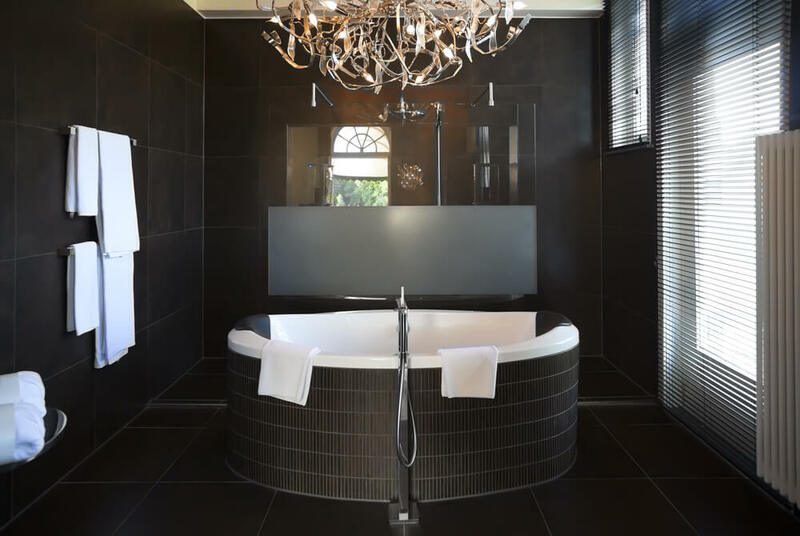 Our luxury bathroom designs and ideas that will leave you speechless. 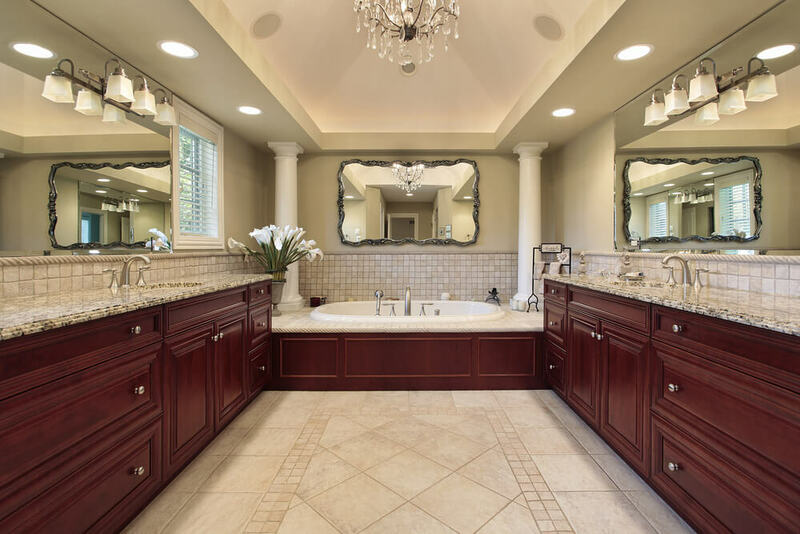 Luxury custom bathrooms are more than a beautiful tub and shower combo. 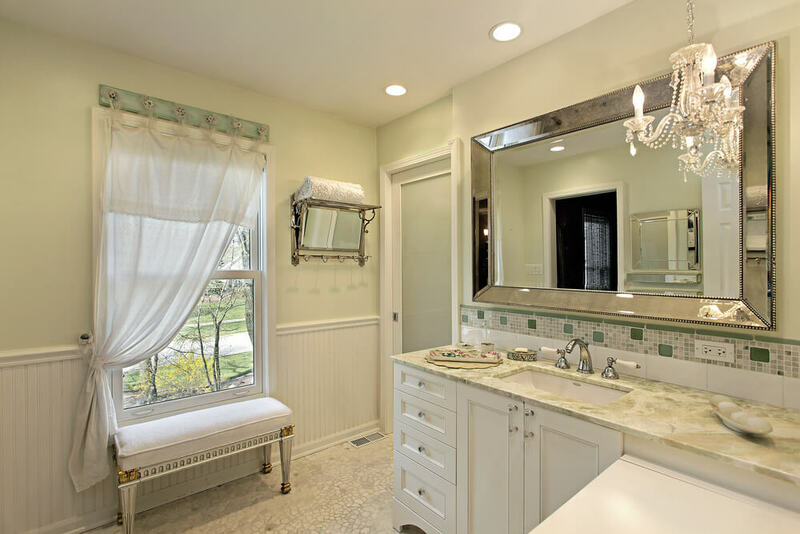 To create a custom bathroom of your dreams, details become very important. From the counter and vanity, to the tile options, your custom bathroom must showcase a taste and style that sets you apart from the standard cookie cutter home. From a mother needing some quite time to a perfect place for a romantic bubble bath, custom bathrooms are an escape from reality. It’s the perfect place to wind down and relax or get ready for a night out on the town. So we recommend that you take a little extra time on your bathroom plans. 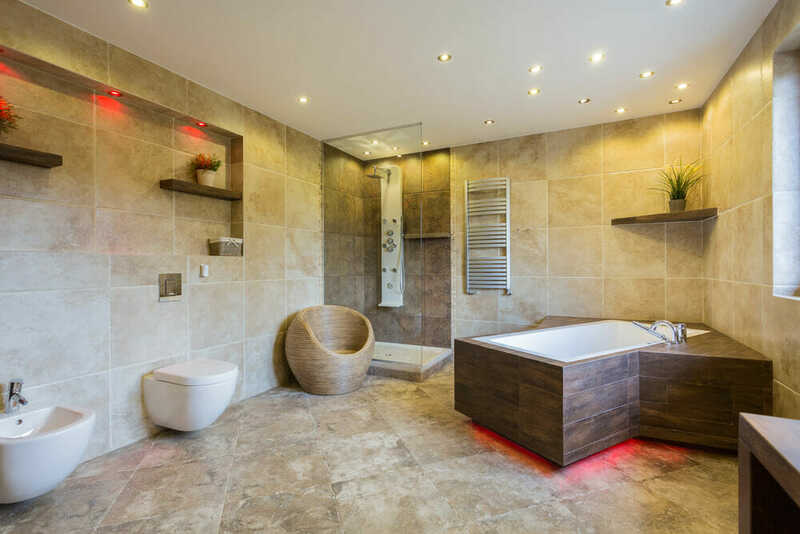 Make sure you create a custom bathrooms that meets all your needs, but also creates an atmosphere that calms and relaxes you from the stresses of your daily life. 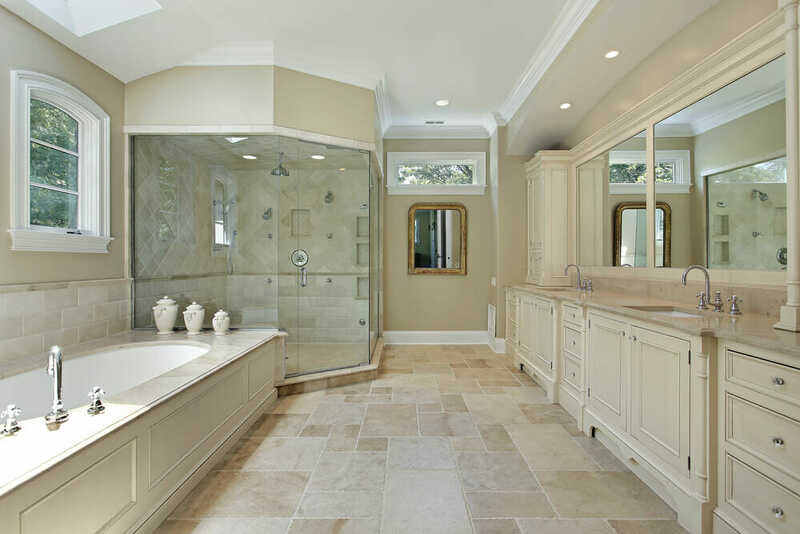 If your bathroom design plans can make room, create a wide and open space that will allow you to spread out. 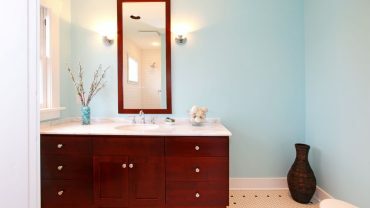 A small bathroom creates a lot of clutter and is hardy a nice place to relax. 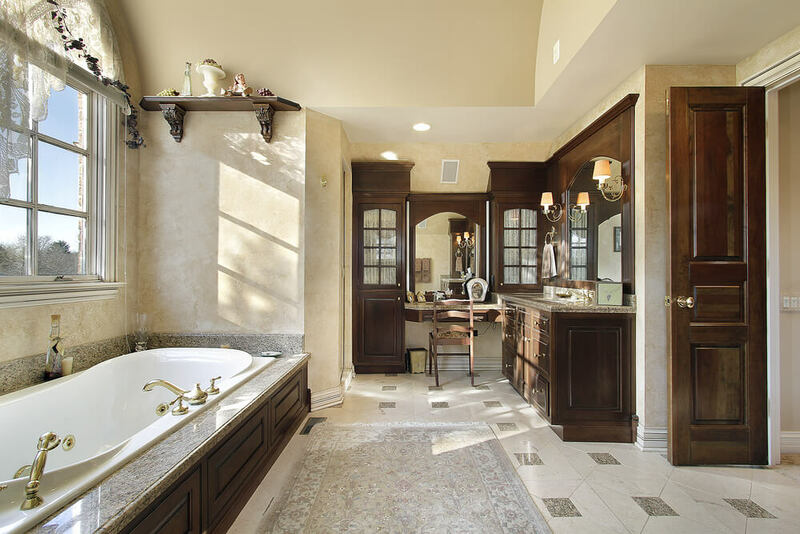 The trend we are seeing is larger and larger bathrooms that can open up a lot of unique options for your home. 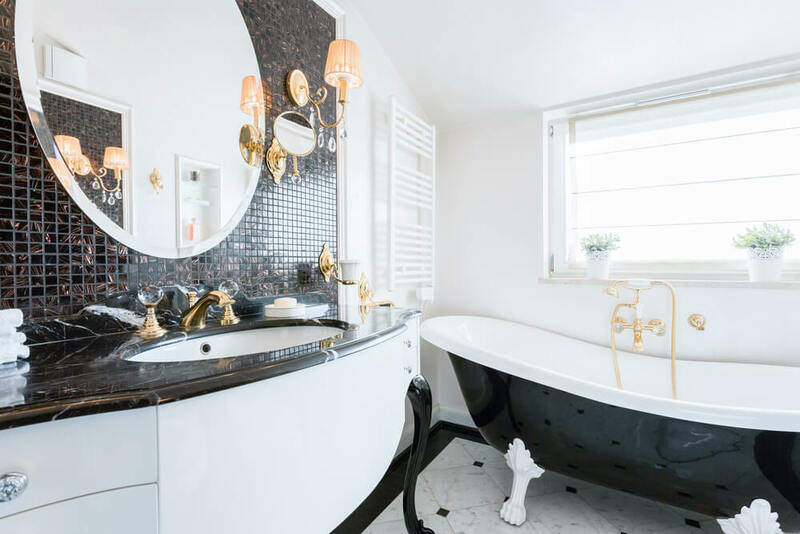 Whether your new home has a spacious bathroom or you are remolding to make more space, below are a few custom bathrooms that should really get you design ideas flowing. 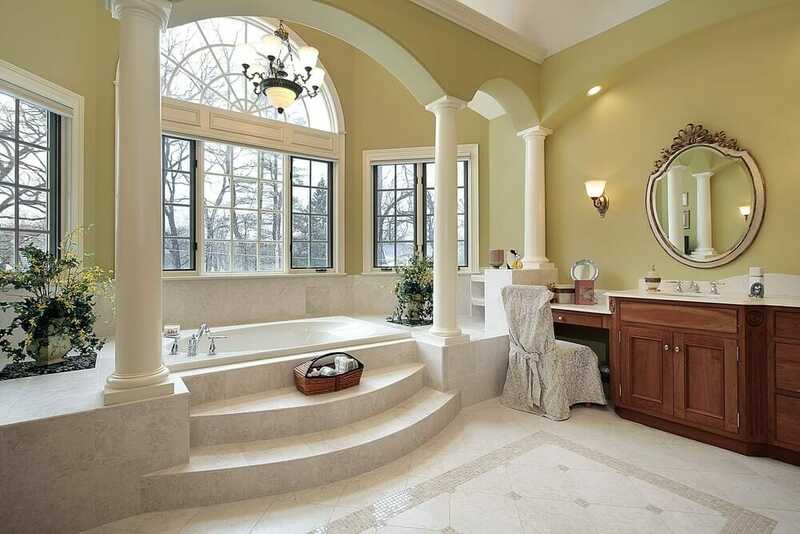 Words do not do this luxury bathroom justice. The attention to deal in the cabinetry and marble flooring is over the top. This custom bathroom is designed with beautiful light tile with dark wooden cabinets that create a wonderful sense of contrast. 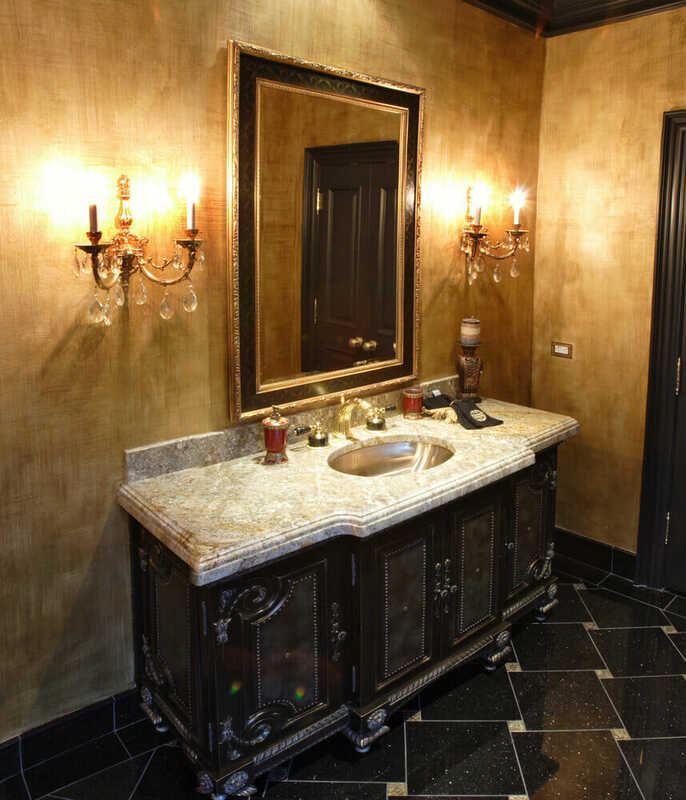 Rich warm tones on the walls along with ornate decor gives a true feeling of luxury. Light/warm tones with large tiles on the walls give an open yet homey feeling. The glass finish with sharp lights adds to the openness of this bathroom. White colors represents calmness. Candles and that soft touch of elegance, will give amazing experience while bathing. Custom bathrooms come in all colors. This rounded bath tubs is a new style introduced by designers. 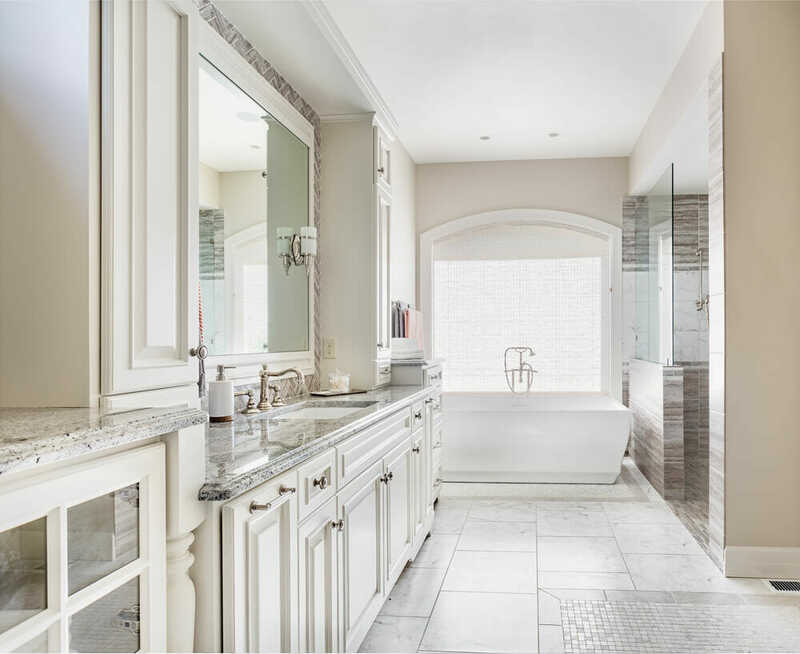 Light colors give a serene yet luxurious feeling to this bathroom. We love the subtle chandelier and silver framed mirror. Mosaic style red and black combo on wall is a new trend. 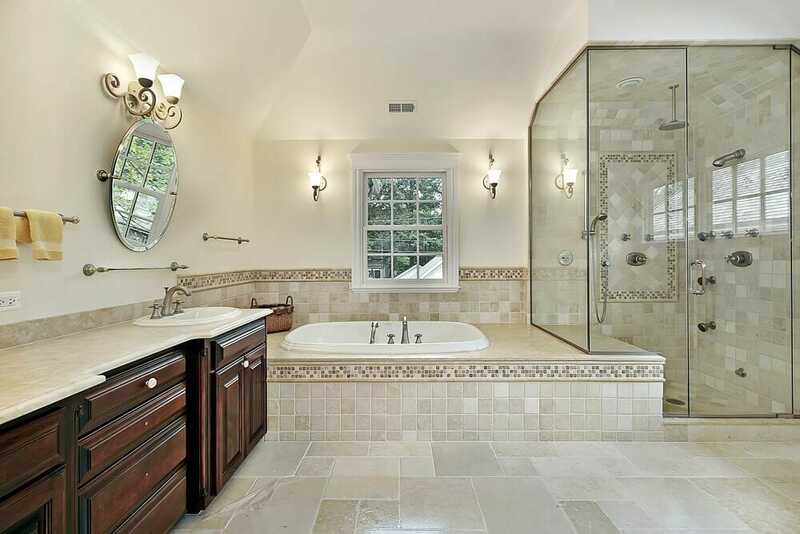 Notice the modern curves in the bathtub and sinks. 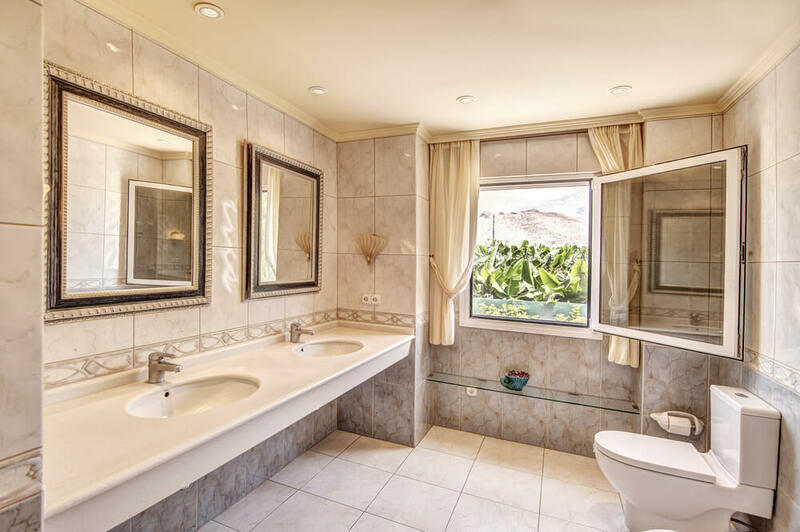 If privacy permits, natural light in any bathroom will give a wonderful experience. Tile from floor to ceiling, with two mirrors with matching frames adds a hint or richness. Beautiful warm tones with cherry wood and a perfectly place lounge bench. What a simple yet elegant design. 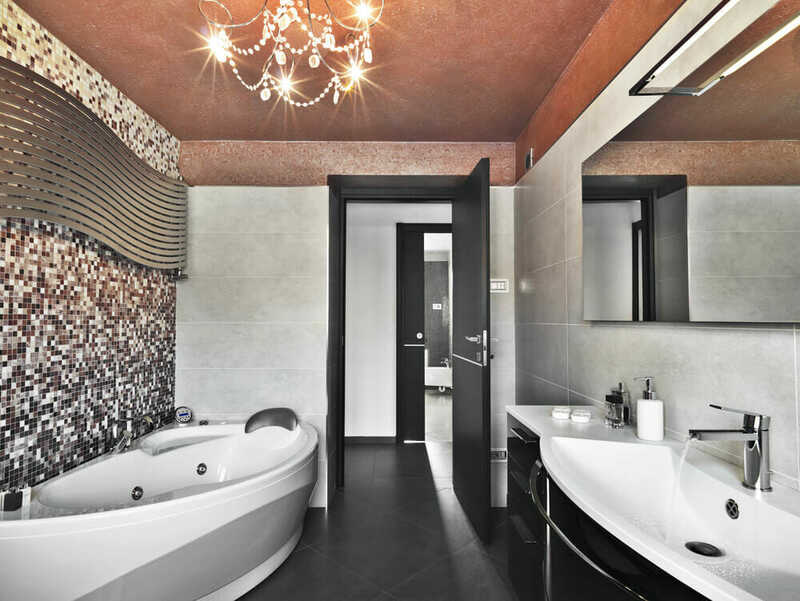 Stand alone tubs continue to be a highly sought after options for luxury. Creme and warm tones go so well together and give you a feeling of a day at the spa. Notice the combination of beautiful color with texture that completes the design. An “L” shaped room with cabinets that extend along the walls. There are lot s of extra room for storage that is a huge plus for any bathroom. A very spacious room with grey cabinets, granite counters and a stand alone mirror for decor. 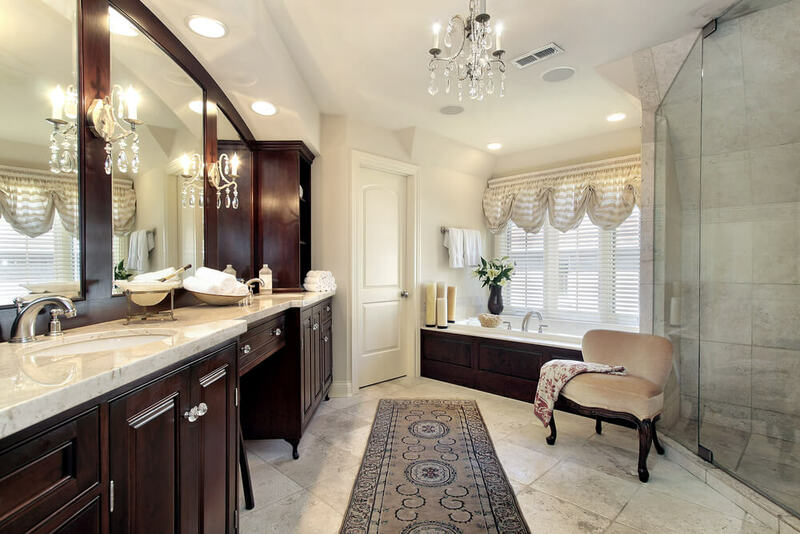 Make your bathroom a little feel less cold by adding large rug in the middle. They help with slip but also add to the overall look and feel. Nice cabinet designs on both sides of the bathroom. Lamps and windows make it a beautiful presentation all together. 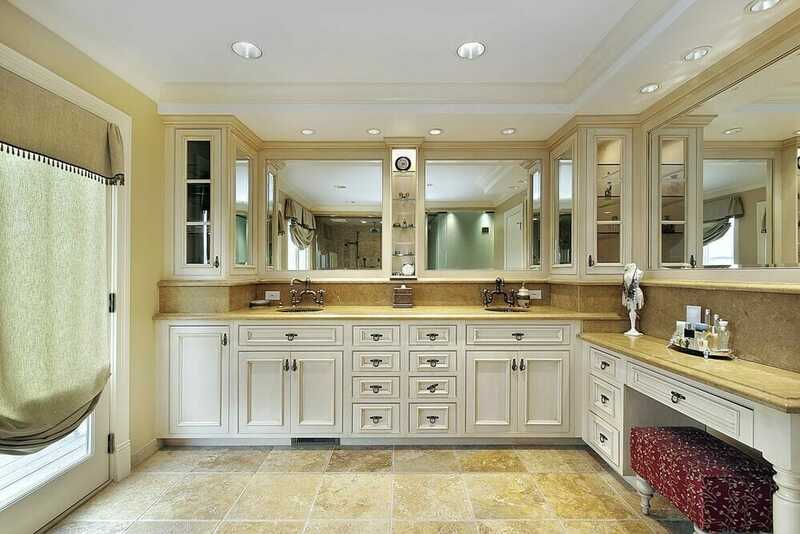 White cabinets with shining marble utilized on floor makes it more bright and clean. A simple yet elegant design. 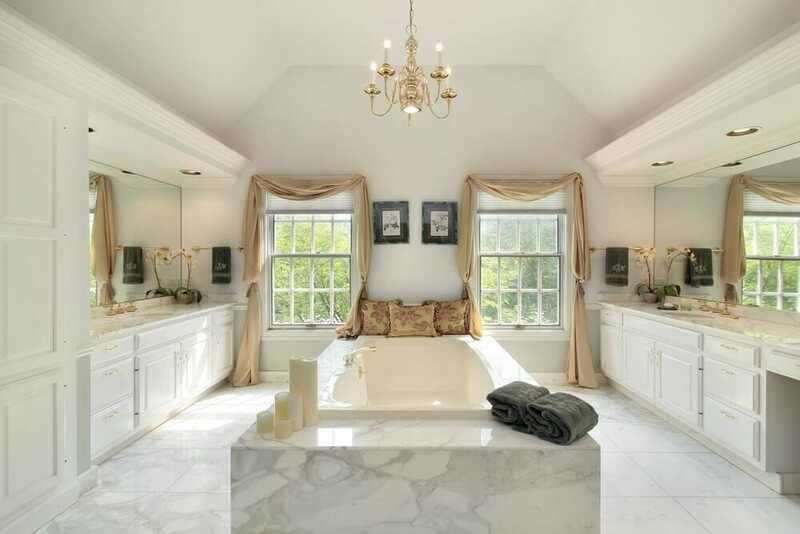 Windows surrounding the tub makes it picture perfect. Custom bathrooms with large shower with lots of options along with the built in tub. Bay windows surrounding a stand alone tub give s a nice touch along with the custom dark cabinets. Classic symmetry can still have a lot of impact. We love the use of the tile that wraps around the sinks and tub. Elegant design with a small mirror. The shower on the other side with a bath tub gives a lot of versatility. This amazing design with bath tub and a standing shower maximizes the size of the room . The cabinetry and crown moulding really help to set this room apart. Loving the tile job and the utilization of the fireplace makes this bathroom a winner in our book. 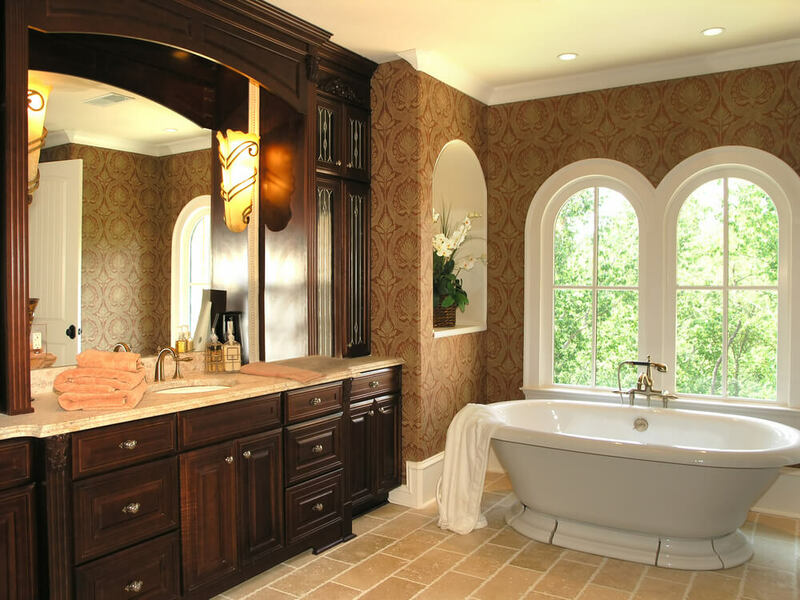 This traditional styled bathroom has two cabinets for storage and the tub as the center piece. 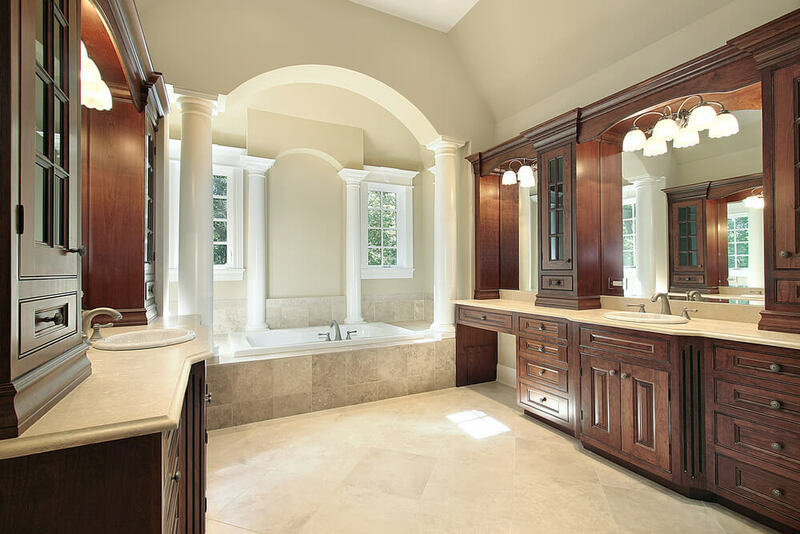 The use of columns can really give a high end look and feel that will set your bathroom apart from the neighbors. The contrast of black and white makes the room look stunning. A more modern and simplistic approach still made our list because of its sure elegance. If you love white then you will love the elegant and fresh feel to this room. Flower and candles go a long way to help with decor. Although light in storage who can say no to that vanity. Simple design yet full of details. 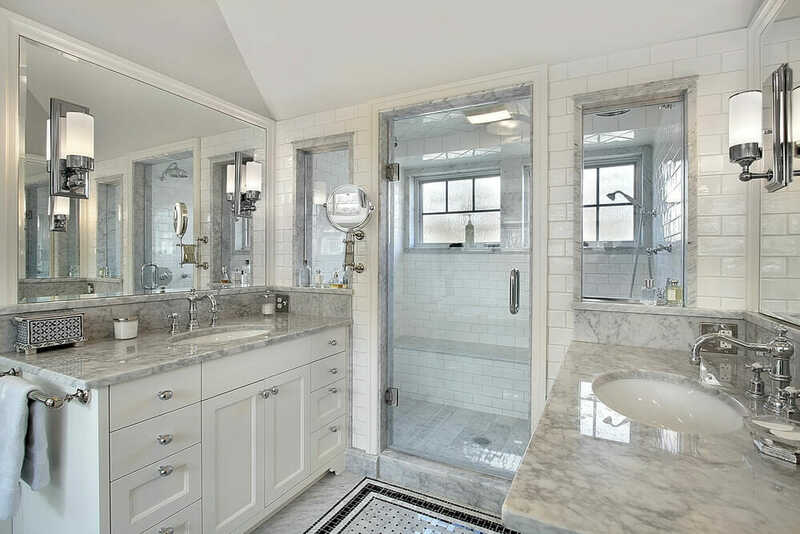 From the wood trim to the marble flooring this bathroom says luxury. White rooms are still the rage. We love the mirror light coming from the upper cabinetry. Unique trim around the windows along with claw foot tube makes this room a one of a kind! Sometimes its all about the chandelier. With a beautiful vaulted ceiling its hard to image this is somewhere you would every want to leave. 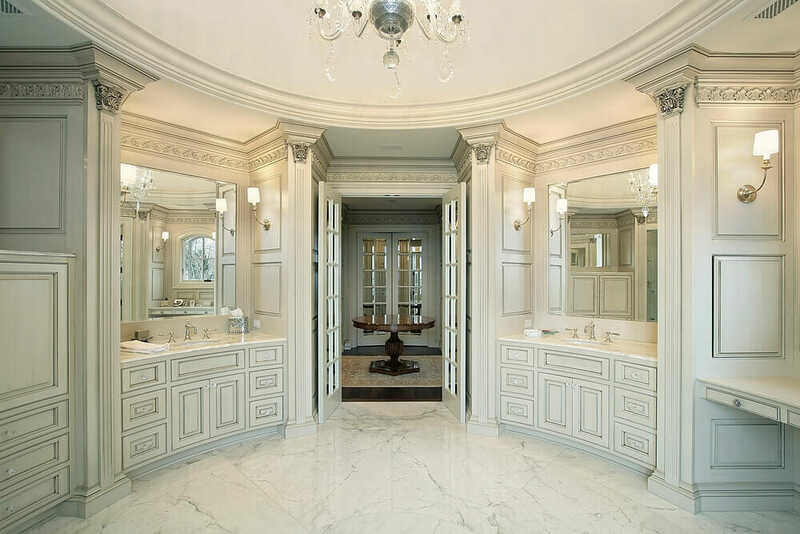 Elegance is what the right word for this bathroom. The cabinets and doors matching can really add to the overall feel. Simple and clean, the white/warm and silver combo is pleasant option with all white seems overwhelming. White subway tile with accents of gray and silver give an luxurious Italian feel. Comfort meets luxury in this design. The counter tops and marble choice play nicely together. Simple touches with decor can really make a bathroom stand out. From the runner the the lighting choice this one is all about the details. Warm tile and unique cabinets really set the bathroom apart.